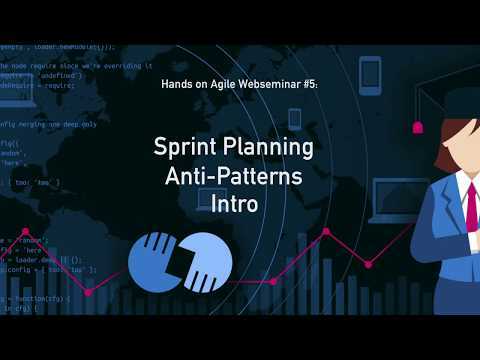 Note: If the browser will not play the playlist automatically, click here to watch the Webinar Sprint Planning Anti-Patterns playlist directly on Youtube. The purpose of Scrum’s sprint planning is to align the development team and the product owner. Both need to agree on the shippable product increment of the next sprint. The idea is that the development team’s forecast reflects the product owner’s sprint goal. Also, the team needs to come up with a plan on how to accomplish its forecast. If the scrum team has been successfully using product backlog refinements in the past the sprint planning part 1 will be short. The development team and the product owner will adjust the discussed scope of the upcoming sprint to the available capacity. Maybe, someone from development team will not be available next sprint. So, one or two tasks will have to go back to the product backlog. Or a valuable new task appeared overnight, and the product owner wants this task to become a part of the next sprint backlog. Consequently, some other user story needs to go back to the product backlog. A good team can handle that in five to ten minutes before moving on to sprint planning part 2. During sprint planning II the team breaks down the first set of sprint backlog items into subtasks. Team leads? The development team does not come up with a plan to deliver on its forecast collaboratively. Instead, a ‘team lead’ assigns tasks to individual team members. (I know that senior developers do not like the idea, but there is no ‘team lead’ in a scrum team. Read More: Why Engineers Despise Agile). Output focus: The product owner pushes the development team to take on more tasks than it could realistically handle. Probably, the product owner is referring to former team metrics such as velocity to support his or her desire. Scrum’s sprint planning is a simple ceremony. Invest upfront during the product backlog refinement, and you will keep it productive. Most of the beforementioned sprint planning anti-patterns are simple to fix. Just take it to the team. What sprint planning anti-patterns are missing? Please share with us in the comments. Elena, the capacity does not exceed 100% — spikes are a part of the “new issues” segment. Vic, I derived the figures from teams I worked with in the past. They are a startup point, but I recommend that you adjust them over time according to your requirements. A mature application close to sunset may require more bug fixing and less refactoring. If you have the chance to build an application from scratch and you can focus on test automation, reserving 10 % of capacity for bug fixes may be excessive. If the daily business is volatile, I recommend allocating – similar to slack time – a certain percentage of the capacity to handle these unplannable issues. Such an allocation could also compensate for team members that help out other teams. Stefan, enjoyed the sprint planning article very much. It is an area I am focusing on now as our teams as not as consistent as we need to be to delivering the forecast. For your diagram, do you collect data from past sprints or just ask the team to come up with numbers like 8% buffer for bugs? I assume you don’t discuss this with the PO or PMO as they could scrutinize these different “buffers”? Do you have any more insight on tasking? Also don’t forget about team members that get dragged into helping other teams and calling that out as part of losing availability as well as surprises in people taking time off which differs from what was known at sprint planning. With small teams, the impact can be larger than expected.